Highcliffe on Sea - Place on a Page - Castle Surveyors Ltd.
Highcliffe-on-Sea (usually abbreviated to Highcliffe) is a small town in the borough of Christchurch, Dorset in southern England. It forms part of the South East Dorset conurbation along the English Channel coast. The town lies on a picturesque stretch of Solent coastline with views of the Isle of Wight and its ‘Needles’ rocks. Highcliffe is situated to the east of the historic town of Christchurch and the resort town of Bournemouth, and Barton on Sea to the west. The New Forest National Park is situated to the north. Its position on the south coast gives it a climate with milder winters than inland areas and less rainfall than locations further west. This helped establish the town as a popular health and leisure resort during the late Victorian and early Edwardian eras. What is now regarded as Highcliffe has developed over the last several hundred years from the hamlet of Slop Pond, the Chewton Estate, and Chewton Common. The latter two also contained large farmsteads. Slop Pond was a collection of thatched cottages, named from the large pond on its common. The cottages were said to be occupied by farm workers and fishermen, who engaged in the smuggling and poaching trade now notorious in local history. When the area became a more popular tourist destination in the Victorian era, Slop Pond was renamed Newtown. This was changed to Highcliff after the first house built on the high cliff, soon to become known as Highcliffe-on-Sea. Between 1831 and 1835, Lord Stuart de Rothesay built Highcliffe Castle, a Gothic Revival home, near the site of High Cliff House, his father’s Georgian estate. The design, by William Donthorne, a founder member of RIBA, incorporated large quantities of carved Medieval stonework salvaged from the Norman Benedictine Abbey of St Peter at Jumieges and the Grande Maison des Andelys. At the beginning of the 20th century the reputation of Highcliffe was so considerable that in 1907 Kaiser Wilhem II chose to stay at Highcliffe Castle when recuperating from the strain of political scandals in Germany. Highcliffe Castle is now a Grade 1 listed building described as “the most important remaining example of the Romantic and Picturesque style of architecture”, and now holds events throughout the year open to the general public. It is also a popular venue for weddings and other private events. Harry Gordon Selfridge, founder of Selfridges & Co, rented the castle between 1916 and 1922. He is buried in a simple grave at St Marks Churchyard next to his wife and mother. 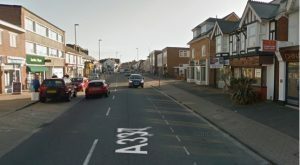 The area also has a strong literary connection and was once a centre for Wicca with Gerald Gardner and Dorothy Clutterbuck living in Highcliffe. Captain Frederick Marryat, author of The Children of The New Forest, was a regular visitor to the house on the Chewton estate (now the Chewton Glen Hotel, Spa and Country Club); and the adventure story author Colonel R.W. Campbell, veteran of the Boer and Great wars, was also a local resident. After a few years of relative obscurity, Highcliffe is gradually returning to its heyday as a seaside resort. Fuelled by its enviable location and the popularity of The Chewton Glen Country Club, the Highcliffe Golf Course, and the Nature Reserve at Steamer Point, Highcliffe is becoming a popular area for those relocating to the coast. There has been an increase in development in the town to counteract the shortage of housing; some of this has caused local controversy and there are plans in the general area, such as Hoburne and Roeshot Hill, for further residential development, with the former caravan park at Cobbs being recently developed to provide modern housing also. This development has also seen a small resurgence of up-market restaurants and cafes, rejuvenating the High-Street to help off-set the reduction in traditional users such as banking and retail outlets which have been affected to a degree by the development of a Tesco Local Store. Educational establishments in the town include Highcliffe St Mark Primary School and Highcliffe School, whose OFSTED reports are above national averages on most levels and the School places are sought after in the general area. There are also independent preparatory and secondary schools local to the area in New Milton and Barton on Sea. The Maritime and Coastguard Agency’s national training centre, responsible for delivering the UK’s coastguard training, is at Steamer Point and is currently being considered for redevelopment also, possibly further residential development. 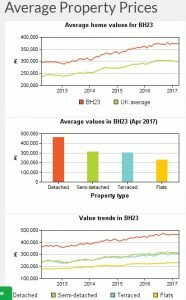 The trend at present in the area is to source and develop, including extending into roof spaces to create chalet type properties, bungalows and updating these to a ‘high standard’ has proved profitable for local developers over recent years.